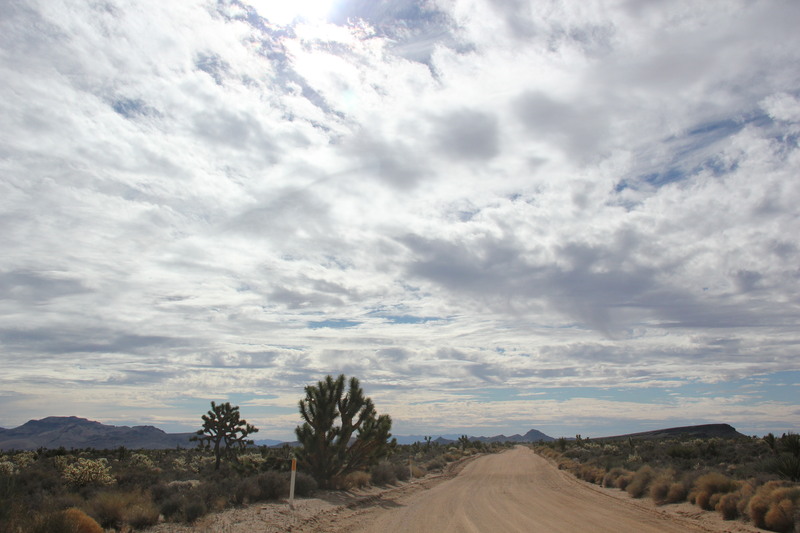 Not so long ago we drove from LAX across California to the Mojave Desert. With a vague notion as to which direction we needed to go and knowing we had a cheap hotel room booked somewhere towards the far horizon we headed east. Before we knew it we were on the old Route 66. As usual, we forgot to pack the maps but, always happy to add to the growing collection back at home, we bought another one somewhere along the way, sat back and enjoyed the journey with most of the photos taken from the passenger seat if only because, as usual, the hotel was further way than we thought. It was in Arizona, over the Colorado River from the casino town of Laughlin in Nevada where we went for dinner. Laughlin is a story for another time but the breathtaking silence and beauty of the Mojave is a journey in to the gentle whispers of time. Here are some photographs of the journey through the time that was once a golden age of motoring on the fabulous but now faded Route 66. The photos are outrageous! It’s been a goal of mine to travel the entire old Route 66. All I need is the time to do it properly! John, hope you get the time to do it eventually and one day we might even do it properly! Bucket list! I’ve always wanted to travel that part of the US, and get my kicks of Route 66! Best wishes to you for clearing this one from your list and I look forward to hearing of your adventures out there. You will not be disappointed! Wow Patti – I was only watching Cars again the other night. The Mother Road… Great set of shots. Martin, it is train paradise out there and I can only imagine the great set of shots you would get! My big regret is not getting a shot of the train driver waiving at me but that’s because I was busy waving back at him! And so you should 🙂 Train drivers are the salt of the earth – my GrandFather drove expresses for the LNER and British Railways in Steam days. Being a mug I chose to go for the money instead of my heart – Telephone Engineer ain’t the same as Railway Engineer 😦 Bad choice in my younger years though I’ve grown out of it now. The choices we make . . . lovely to hear about your Grandfather Martin. The legacy of his influence lives on in your enjoyment of trains. 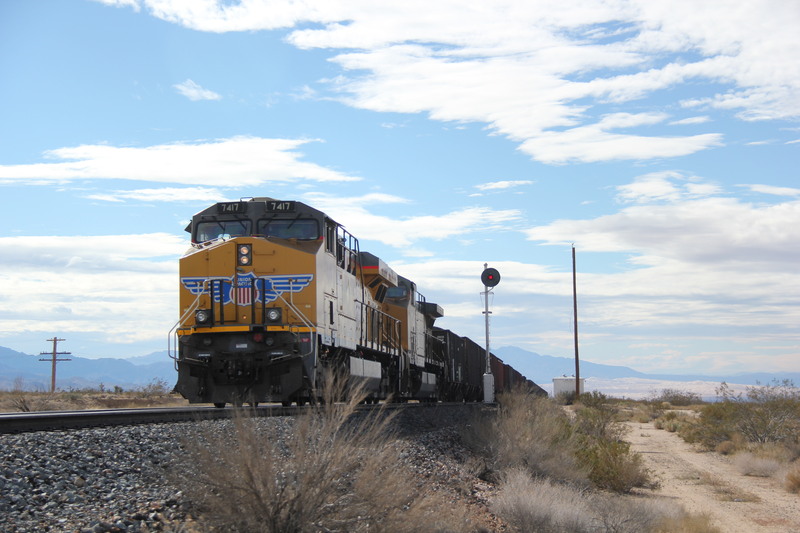 Something about a train always seems to stop me in my tracks, the power behind them is exhilarating. Now if only those branch lines in the UK could see the light of day again . . . Thank you Margie, this is the rushed version of the journey – certainly no cool crab claws out there! you captured that “ROUTE 66” feeling! and it keeps capturing us! Thank you Frizz! Wow! Great collection of photographs Patti. Stunning. One of the best entry for this week’s challenge. You are very kind, thank you Arindam! Love your colourful railway shots! Fantastic, I would love to do this trip someday. One day someday soon I hope for you ad thank you so much for your comment! Your black and whites are so good and so inspiring! Isn’t that a hoot and how lovely that we are so connected! Andy, thank you! You know you have a bad attack of nostalgia when the Bee Gees bring a tear to the eye! That is very kind and much appreciated, thank you Joshi! 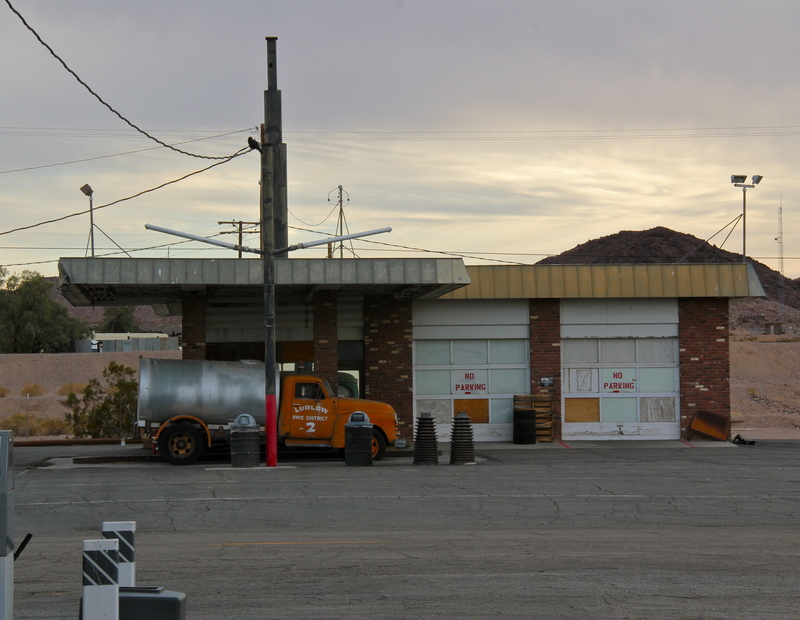 Somehow, even in the middle of nowhere, it is so easy to feel like the “stranger in town” – almost as though we have wandered onto a John Ford film set! Thank you SiG for coming along for the ride! Heather, great to see you here! Love your takes from Aging Gal and often look fwd to checking in. Twitter is such a funny little creature – I have days when I love it and others where I have forgotten all about it but I could almost say the same about Facebook. All best to you and Bitty and thank you so much for popping by. See you over at yours soon! Welcome and thank you for your company fellow traveller! Your latest post is so informative and inspiring ie, any aspiring writers in search of inspiration and confidence via the financial boost of grants get over to Zen’s latest post for info! Really liked the click of the Stardust Inn….so nice and so vintage! Tempting to know just how vintage the rooms at the Stardust Inn are! Thank you TU! Love your capture of Rt. 66. these photos are marvelous! Thank you SF! One day we might do the more leisurely version instead of having it flash by. Still, better than nothing given our limited time! Nice images. The 2nd would make a great black and white. Thank you Rick for the idea – will get to work on it! Reminds me of an old Clint Eastwood movie or something similar. It did feel that way out there! Amazing photos. I’ve always wanted to drive a portion of this in the southwest US. The start of Route 66 is just across the street from the Art Institute of Chicago. Haven’t been much further on Rte 66 than that. You would love it, and how handy for you to have the starting point nearer than further. Do hope you get to explore it one day, you won’t regret it and thank you Anne so much for your kind comment! “…the gentle whispers of time.” What a perfect phrase to go with these incredible photographs. It is such a simple but magical place . . .thank you so much for your very much appreciated comment. I am touched. Fantastic photos! So evocative and so iconic. They remind me of a small exhibit I saw here in the Netherlands recently, which featured similar western road images. 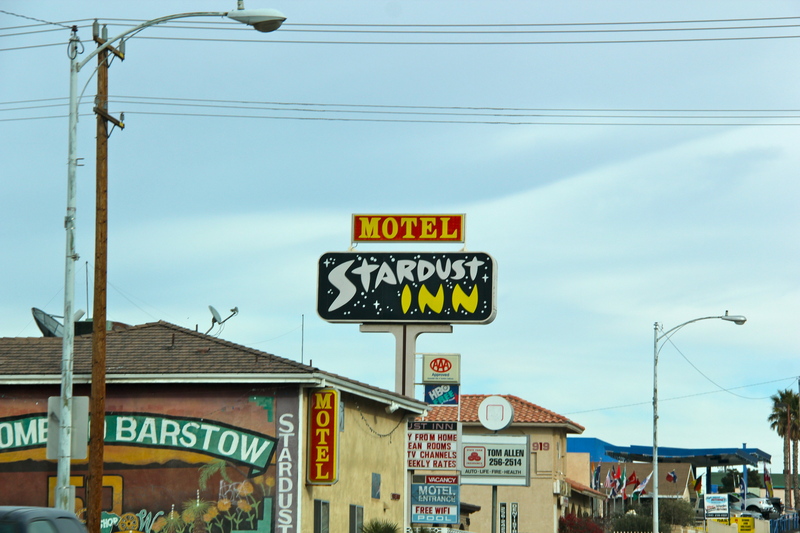 LOVE the Stardust Motel sign! Thank you Alison! There is so much beauty out there even if some of it is faded and rusty with age. How popular was the exhibition? Lovely captures of a fabulous journey Patti! Great entry! Thank you Theresa! Thinking back on it I do feel as though we have returned from a twilight zone . 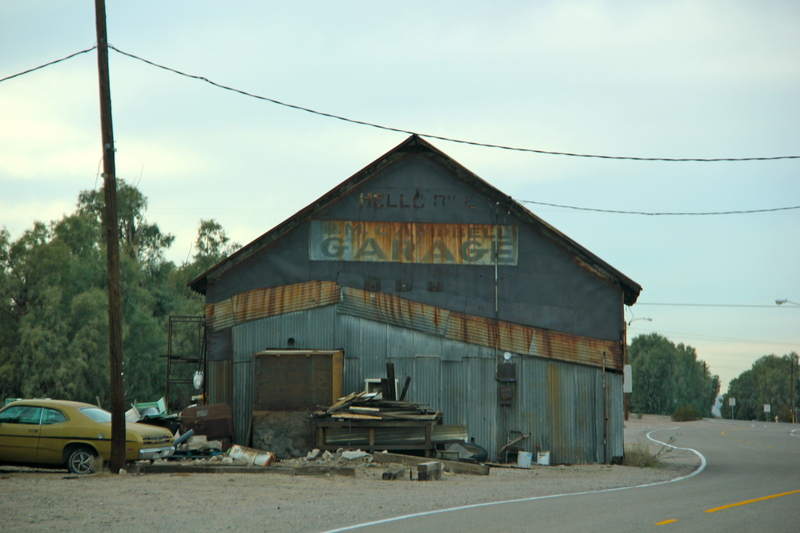 . .
It’s fascinating to see the changes of route 66. Although people may have forgotten how it used to look, it still is beautiful. I wish I saw it during it’s golden days. Thanks for sharing these amazing pictures. Have a fun weekend. Imagine what the Mojave have to say about the golden days! Always lovely to hear from you IT and all best to you for the week ahead! I know how well you do these scenes so thank you double for your comment! you’re welcome! And thank you very much for the compliment. I think the interstate highway system made route 66 a nostalgic memory. It is amazing how fast our roadway infrastructure has grown in the last 100 years if you really stop to think about it. 100 years ago, I dare say there were as many horse & buggies on the roads as there were cars. I suspect cars were still a novelty in 1912. My have times have changed. And somewhere between now and then, route 66 was the road to travel! Marcy, I share your amazement and fascination! I am always struck by the absolute peace and quiet out there where once upon a time native Americans lived with the land which was then crossed by those tough pioneers in their covered wagons who didn’t have a Best Western to pull into for the night! Good Morning, Patti. My post evidently implied I’ve actually traveled route 66, which isn’t the case. I have read about its history though, and watched an extremely interesting documentary series on the birth of our interstate highway system. 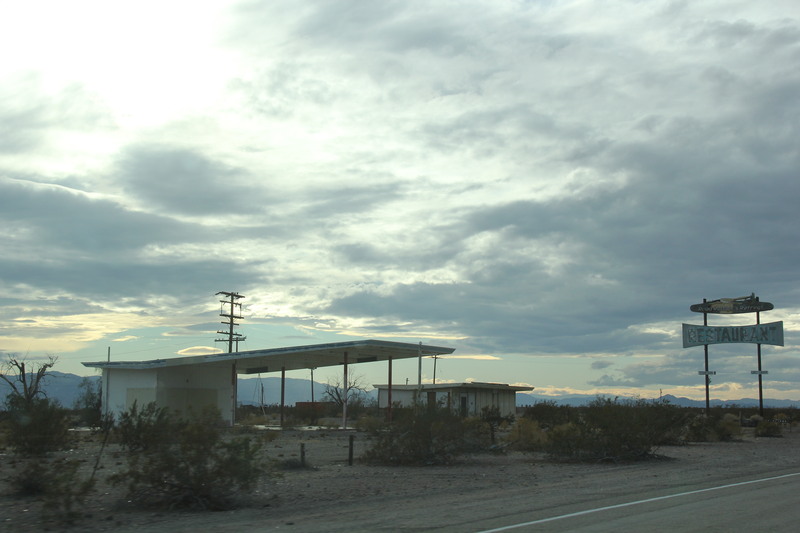 One part of that film focused on how route 66 became pretty much obsolete overnight. It is sad how the little man (in this case, the little road) always gets pushed to the side due to progress. Personally, I’m a back roads person, so I’d probably take route 66 if I were in traveling in that area, just to check out its charm. Speaking of pioneers, people today don’t know how lucky we are. Our forefathers were something to be proud of, given their strength and perseverance. And good morning to you Marcy! However we travel that route, either for real or via the armchair, the fascination and curiosity are real! Route 66 seems to be one of those cultural touchstones that fans the world over have a familiarity with and a longing to explore. Am with you on the back roads! Unresponsive and difficulty scrolling. Anyway could we call this “highway art deco” ? Great pics for short writing prompt contest. Just sayin…. I love the sound of “highway art deco!” Sorry about the scrolling problems, I say through gritted teeth but I shall go back later and re-do the post. Thank you Carl for your company and patience! For me, here in the Netherlands, Route 66 is something of pop-songs (Stones, Chuck Berry, Nat King Cole and probably a lot more). I have this romantic vision of an endless, straight road through a dry, dusty, endless space with only the lonely rhythm of poles, carrying a telephone-wire. Thanks for sharing these shots; they fit quite well in the romantic vision. Thank you so much Harrie! Hope you get to travel R 66 someday. It disappears in places while in other parts you can find souvenir shops etc doing everything to keep the flavor of the times going. It must have been quite a trek in its day when it was one of the main routes west, before the freeways etc.